Storage is at a premium. Always. No matter whether you’re at home, in an office, or a healthcare setting. This blog considers several reasons a hospital will benefit from bringing in Bedlifts. Hospital bed storage is an ongoing headache for administrators — and the many doctors onsite can’t be much help. But Bedlifts can. 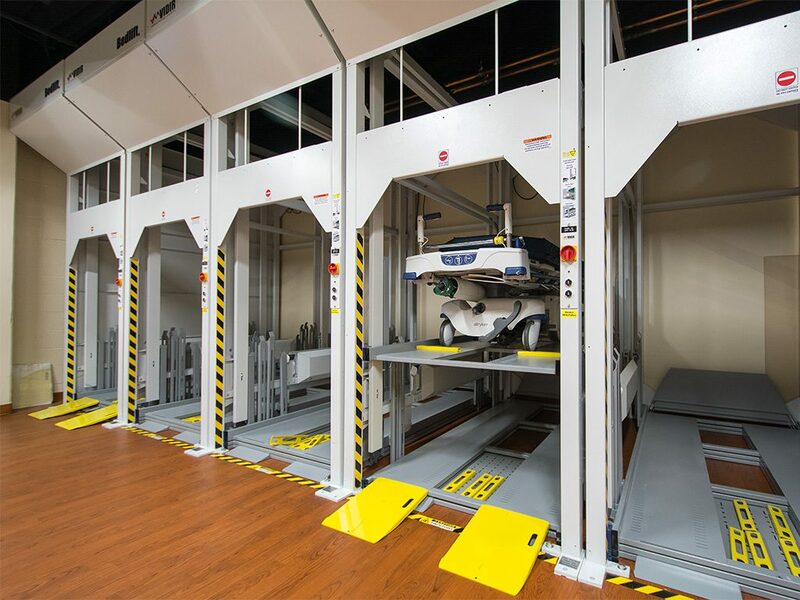 These automated lifts accommodate several, stacked hospital beds. 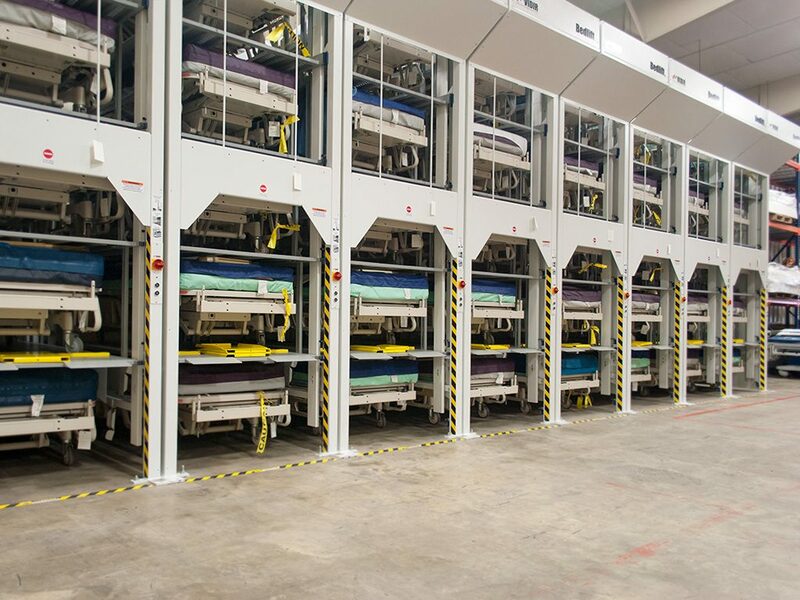 Increasing storage capacity and organization, while reducing down time, customizable Bedlifts can store several beds in a secure manner that protects from unnecessary wear and tear. Many municipalities require hospitals to maintain a certain number of hospital beds in relation to population density. Yet, giving up valuable square footage can prove costly. 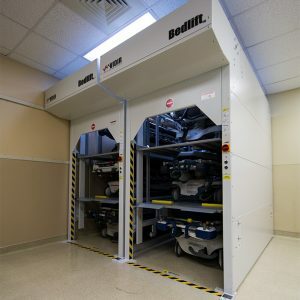 At the same time, storing the beds can also be challenging as they must be readily accessible to patient areas (without causing safety concerns). Often beds are kept in a warehousing facility, manually racked, with workers using forklifts to get them in and out. 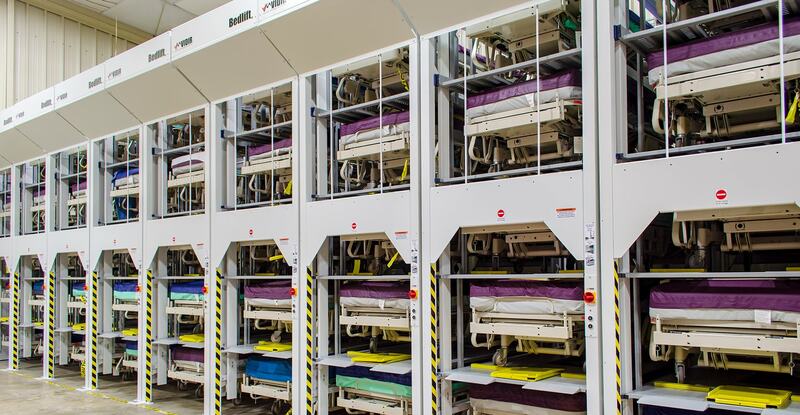 With bedlifts, automation of hospital bed storage adds efficiency, making it quicker and easier to retrieve beds as needed. 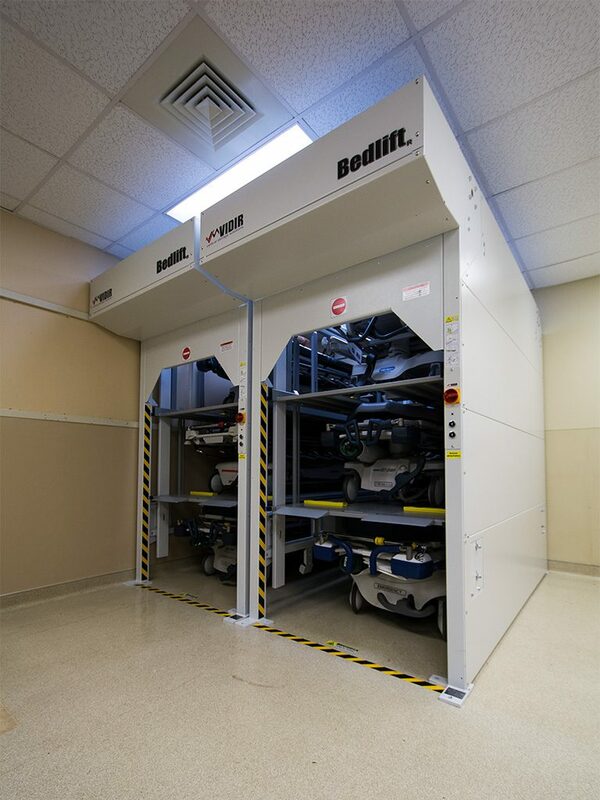 Regaining premium square footage in hospitals not only keeps corridors clear, but also gives the hospital more room for the equipment critical to quality patient care. Beds typically do not stack or fold, and contain many electrical components which may fail. Plus, they weigh as much as 900 pounds and can’t be easily maneuvered. But with bedlifts, you can reduce the clutter and stop impeding access to other stored items. With a bedlift, the hospital can increase its accessible floor space and regain usable square footage. Simultaneously the lifts reduce fire hazards, make hospital hallways safer for staff, and eliminate the risk for JHACO penalties or failure to comply with Fire Marshall code. Labor may be the primary expense healthcare facilities are facing, but facility costs come in second. 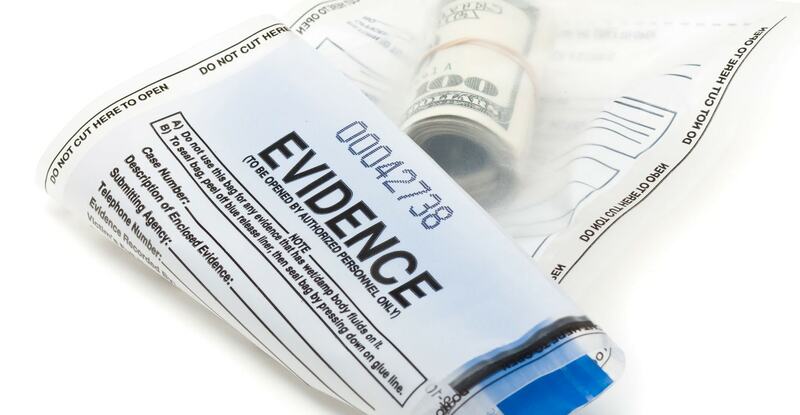 Construction, maintenance, and ongoing operational costs all come into consideration in trying to identify savings. 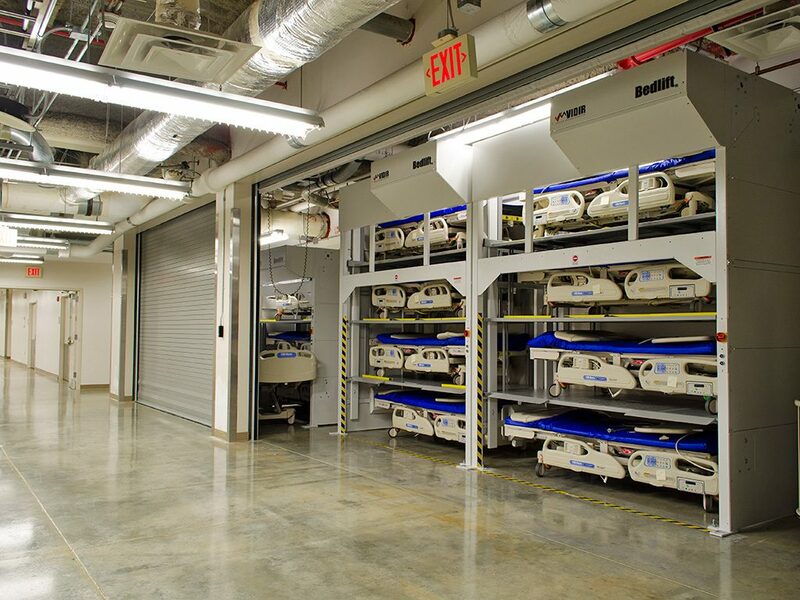 Hospital bed storage can offer a positive impact on the bottom line. 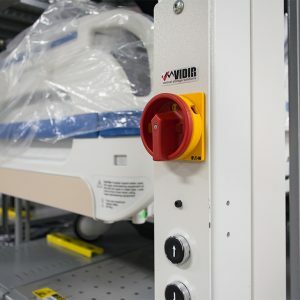 Streamlining access to the beds themselves reduces labor costs as the hospital no longer has to pay employees to transfer beds around the hospital. 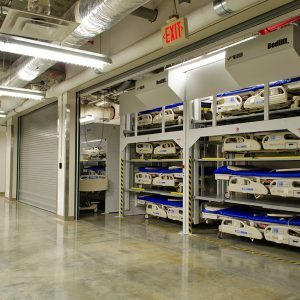 At the same time, hospital bed storage protects your costly investments (up to $40,000 per bed) from getting banged into walls, door jams, and other equipment. 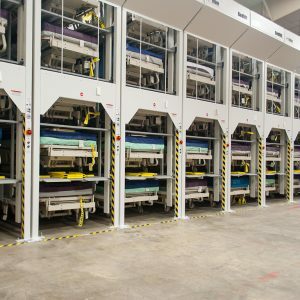 Preserving the beds extends their longevity while helping your hospital realize a better return on investment. 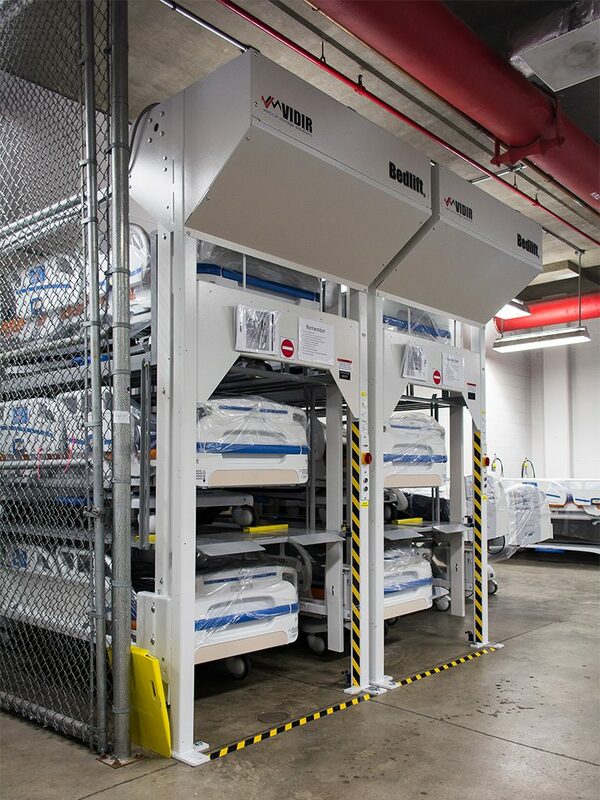 Further, hospitals that consolidate beds onsite in lifts can also save resources previously expended transferring beds to and from warehouse locations as the patient census goes up or down. Not to mention the savings for those hospitals that were renting hospital beds (at a cost of $110-$138/day) to cover surges. 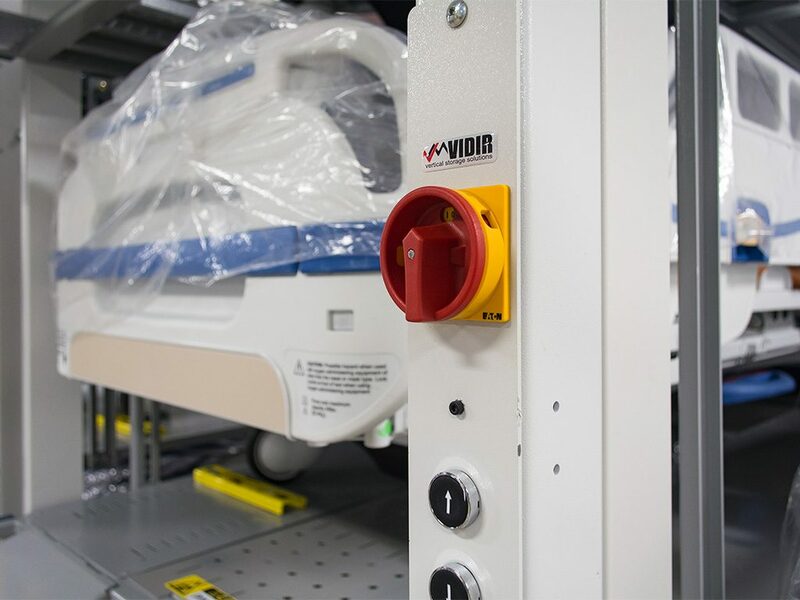 Maximize storage while enabling easy access, fast retrieval, and safe handling with vertical storage of hospital beds. 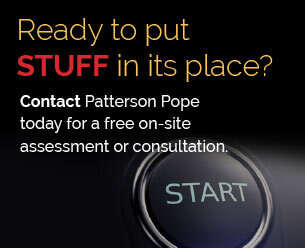 Contact Patterson Pope to learn more about the benefits of implementing bed storage lifts at your hospital. 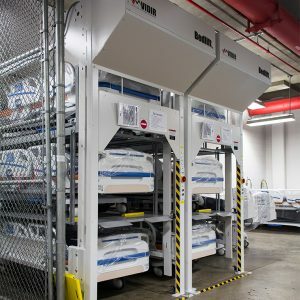 At AnMed’s 461-bed acute care hospital, its Northern campus and its distribution center all three shared the same storage challenge. The facilities had extra beds and not enough room to store them. 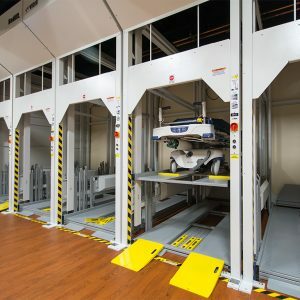 By going vertical and getting away from the forklift, the health system saved valuable space, alleviated problems of keeping beds in patient hallways, eliminated dangerous conditions for forklift operators and significantly decreased damage to the beds themselves.